We were delighted to host our first Societies Varsity at Waterside Campus on 23rd January 2019, which gave our students an exciting opportunity to inject a vibrant atmosphere all over our brand-new campus. This event successfully brought our students together as a community, to raise awareness about our societies to the University. This also opened a chance for our groups to compete, network and make connections with Derby in something they were passionate about! We had seven scored activities in the main competition with two more non-competitive activities to ensure no opportunity to be involved was missed. Activities included board games, art & drawing, using recycled materials to create two turtles representing plastic pollution, debates and quizzes. You can check out the whole day on our Instagram @northampton_su under the ‘Societies Varsity Highlights’. 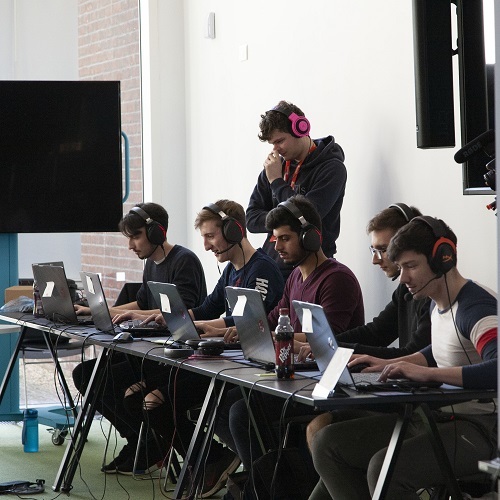 The unsurprising highlight of the day was Esports & Gaming, which managed to receive over 1000 views online as well as an influx of curious students engaging in person! Additionally, other Universities are initiating contact on how they can recreate the Societies Varsity event. Thank you also to all the groups for helping set-up and for participating! Finally, big congratulations to all who won in their competitions, Jacob from Art, Pool and the Nerdy Film Quiz team. The Society Varsity video really captures the day so check it out here! We are very excited for next year and look forward to taking a coach or two to Derby with many more societies joining in!